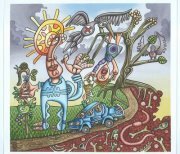 An intriguing show of psychedelic surrealism organised by Frank Rosewell of Show Me Your Art. Once upon a time, a painter named Andy Quayle produced work of a highly personal nature. Though rendered into a code of symbols his images were accurate and truthful. However, this way of working did Quayle’s health no good at all …and ultimately led, in the summer of 2012, to heart failure. His alter ego the musical poet Moff Skellington*, who survived the fateful ambulance journey from Otley to Bradford Royal Infirmary, has now assumed all painterly duties. 1st – 13th Feb. Please come into the gallery at the weekend for wine, nibbles and to see the show, from 10am until 5.30pm Friday, Saturday and Sunday. Late Thursday 7th Feb 5pm – 7pm.